Back in April of 2012, I built an Intel Z77 workstation that used a 512GB OCZ Vertex 4 SATA III SSD, plugged into a SATA III port for it’s Windows 7 boot drive. 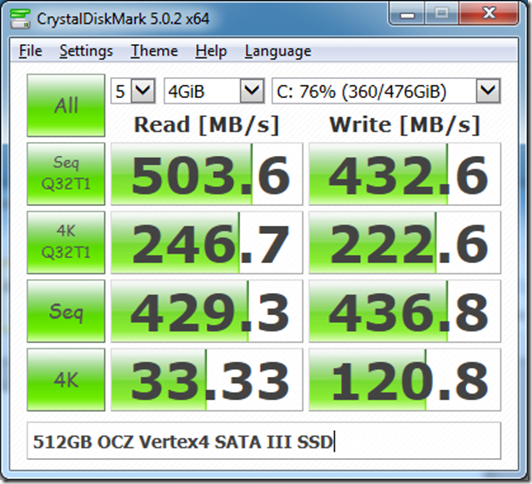 Back then, this was arguably the fastest consumer SSD available, with an MSRP of $699.99. This drive has soldiered on for over three and a half years, with no problems. 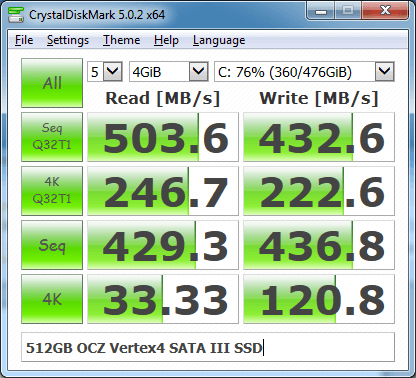 It was getting a little low on disk space though, so I decided it was time for an upgrade to a larger, faster SSD. 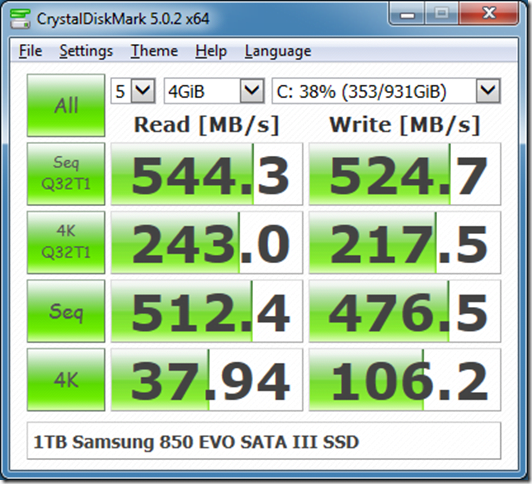 I ended up getting a 1TB Samsung 850 EVO SATA III SSD, for $329.99 at my local Micro Center. The 850 EVO line has been around for about a year now, and prices have come down quite a bit since they were introduced. It is pretty amazing to get double the size (and better performance) at less than half the price, compared to what was available back in 2012. 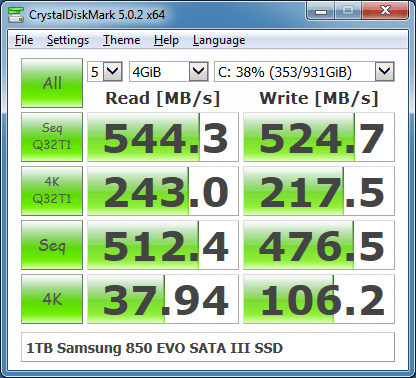 Before I cloned the existing drive, I ran CrystalDiskMark 5.0.2 on it with a 4GB test file. The results are shown in Figure 1. 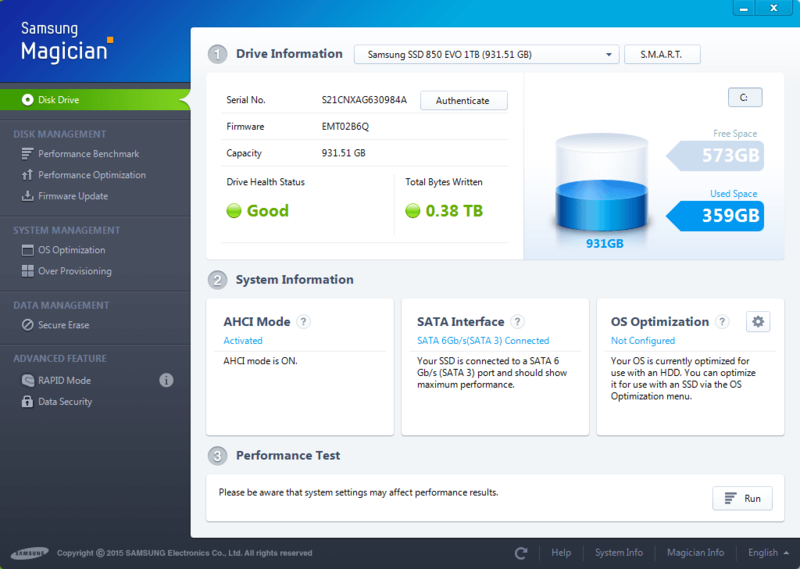 I used the free Samsung Data Migration software (which only works with Samsung SSDs as the cloning target) to clone the old OCZ drive to the new Samsung drive. I used an Apricorn SATA Wire 3.0 plugged into a front-panel USB 3.0 port to connect the new Samsung drive for the cloning process. 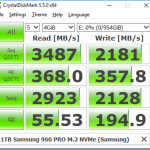 I could have shut down the system, and plugged the new Samsung drive into a native SATA III port to get better copy performance, but I was too lazy to do that… As it was, I was seeing about 125MB/sec during the cloning copy process, which was fast enough. If you are cloning/upgrading a drive in a laptop, you pretty much have to use a USB port to do it. After the cloning process was complete, I shut down the system and swapped the drives. Windows 7 booted up without any problems, although it wanted a reboot once it realized that the drive had been changed. I also noticed that Windows 7 had lost it’s recollection of ever checking for Windows and Microsoft Updates, but asking it to check for updates fixed that issue. Next, I fired up the Samsung Magician 4.9 software, which informed me that the new Samsung 850 EVO needed a firmware update. 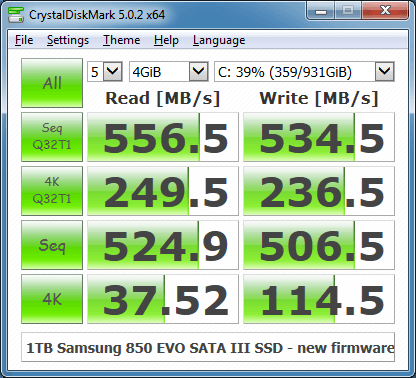 Before I ran the firmware update, I ran CrystalDiskMark 5.0.2 with the same settings as the previous test. The results are shown in Figure 2. After the drive firmware update, Windows 7 booted up without any problems, although it wanted another reboot once it realized that the drive firmware had been updated. 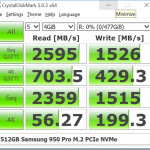 I ran CrystalDiskMark 5.0.2 once again with the same settings as the previous test. The results are shown in Figure 3. 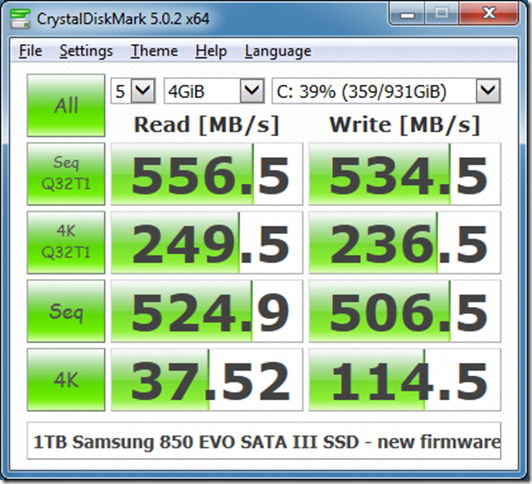 As you can see, the benchmark results improved after the firmware update. I have not found any release notes for the firmware update (and it is not even listed on their web page), but at least the latest version of Samsung Magician knew about it. I have not enabled RAPID Mode on the drive yet, but I know from prior experience that it can have a nice positive effect on performance. It does make it harder to analyze your storage performance when SQL Server is running on your workstation though. All in all, a pretty easy, trouble-free installation. 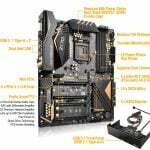 You could have substituted my 6-year old Lenovo T61P for your kit, and the experience would have been the same – easy cloning, W7 instant recognition and boot, Magician really easy to use, and I turned on all the go-faster bits possible. Result: faultless upgrade, then the free Windows-10 upgrade… Also faultless. Apart from a touch screen nice-to-have, it’s a way faster box – no need for a new machine. Great drive and software. Enjoy! BUT, no guarantees on older (circa 2012) MacBook Pro’s – that’s hit and miss, sadly, mine was a miss and had no TRIM support.